It isn’t often that the county’s hurlers outshine the footballers but, on a grim day for the big ball lads, today was certainly one of those rare days. 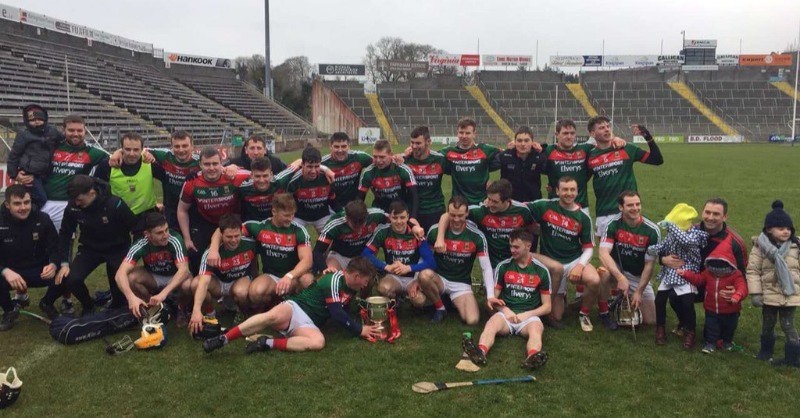 While the footballers were getting whipped at MacHale Park this afternoon the hurlers were claiming silverware up at Breffni Park where they beat Down by 1-15 to 0-14 to claim the NHL Division 2B title and, with it, promotion to Division 2A. Needless to say, I wasn’t there in Cavan today, having instead covered over 500km to see that no-show by our lads in Castlebar. From what I can gather, though, it was a real heroic performance from the lads at Breffni Park, where they were full value for their four-point win. Well done to the lads on a super NHL campaign and congrats to them on sealing the deal today in such fine fashion. Wonderful stuff today from the lads. Was listening on Midwest and by all accounts it was a super performance. It will be massive next year for them to be playing a higher quality opposition, although it will be extremely difficult to maintain their 2A status. That’s for another day. It will bring them on leaps. Christy Ring Cup is a real genuine ambition now and the new format is far better in my opinion. We are in a group with Kildare, Roscommon and wicklow. We’ve beaten wicklow this year, are a division above the rossies and Kildare failed to register a win in 2A. I would fancy us to make a semi final and then who knows? Be great to see us in the new Joe McDonagh Cup next season. Fair play to our hurling team. Great to see guys who have been putting in a huge effort getting their just rewards.Well done. Was in Cavan today, absolutely baltic conditions with light snow falling throughout the match but our hearts were warmed by the performance of our unsung hurling heroes, hope they are having a good night celebrating tonight!! Well deserved…..a small crowd but at least no-one left early! A huge congratulations to the hurlers, a great achievement. Onwards and upwards. As much as I’d like to see Keith back playing football, and God knows we need him, you couldn’t begrudge him this time playing a game he really loves and is probably more enjoyable for him given pressures on football team. Fantastic achievement by the hurlers, and bearing in mind they didn’t have Fergal Boland either. Well done to all involved and the supporters that turned up today. Many congratulations to the Mayo hurlers and hope yea are enjoying the celebrations. It’s always nice to see success. Heroes one and all throughout the campaign. Never stopped believing in the depths of January and February. Good luck in the Christy Ring. Small ball game played with hearts of giants. Believe in the Green & Red!